Note: These were three incidents related to the notion of sky, floating, and flying: first, a cruise across South China Sea on a plane (my journey to Singapore for a residency program); second, a site-specific work at former Air Force Command Headquarters (AFCH); and third, seeing and experiencing artworks which employed VR technology— La Camera Insabbiata by Laurie Anderson and Hsin-Chien Huang, Time Panorama by Ya-Lun Tao, and Afterimage for Tomorrow by Singing Chen—where I contemplated the concept “sky” while floating and flying in the air. The moment of my feet leaving the ground in a virtual environment, which could be refreshing or frightening at times, made me wonder if I am not at all different from the audience who ran away from the screen that played The Arrival of a Train. This new way of seeing includes our physical sensitivity and allows possibilities to expand our future imagining of the sky. Images in virtual environments where the viewers float have been significantly shaping the way we breathe and co-exist with the idea of air, or, the atmosphere invisible to us yet whose connotation keeps getting more complicated in the digital era. Binocular stereoscopic vision helps humankind know not only the physical world but also the illusionary one. Can the way of seeing-floating help us see and understand the air of the future better? Here are some thoughts on life after my VR experiences. I put on an eye mask. My sight was blocked. Pure darkness shrouded my eyes. By doing so, I hoped to quickly detach my consciousness from this scene where physical signals were directly connected to, received and transmitted by my optic nerves, so that I could enter another dimension of trance and floating. I relaxed the muscles of my shoulder and limbs. My hands gradually lost the senses whereas my ears were still tuned in to the sound of the streamlined aircraft shooting through the air at a high speed. The hardly discernible atmosphere wrapping around the planet earth was rubbing sharply against the surface of the aircraft, creating a constant vibration which resonated with the eardrum of every auditory system in the cabin. A piercing, rapid prelude with repetitive frequencies had cut through the AC-dehumidified air. People sat in rows in the aircraft with their sight blocked, waiting for a new visual activity to arrive. At the beginning of the visual activity, the simulation of the aircraft was kept at the center of an illuminated screen. Lands and ocean of different altitudes simulated in the background were sometimes in parallel with the flying direction, or, occasionally, turning slowly at an angle to adjust to changes. The aircraft stayed at the center of the screen the whole time, not moving an inch. Everything else on the screen was constantly changing— gradual shifting or a drastic rotation suggested the physical movements of our current visual activity. It wasn’t the plane flying from one city to the next. The plane didn’t move. It was, instead, one city after another coming to meet the plane. The reef, islands, various groups of islands, peninsulas, lands and ocean were all slowly approaching the center of the vision. The sight was steadily fixated onto the screen. It was the world that kept coming to us in the form of blinking light through the screen. The constantly refreshed feeds, the mixture of different gas matters in the atmosphere, the next land mass, the next sea, airport, city—all kept traveling through our optic nerves via the beams from the screen. The world moved without a specific destination or purpose. Another visual activity, a sight of glaring light outside of cabin windows, took place when the plane was flying over the South China Sea. The dazzling light shined through the air and cloud, reflected and refracted by the glistering water surface. 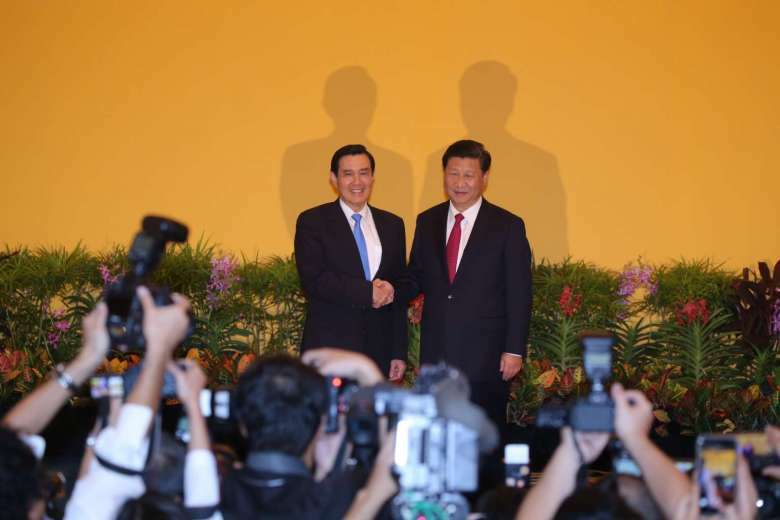 There wasn’t the Mirage 2000 jet fighter flying next to us which carried Ma Ying-jeou to Singapore for a handshake with Xi Jin-ping. There wasn’t the Xian H-6 jet bomber which flew over Bashi Channel and Nandawu Mountain in order to have a photo with Orchid Island. 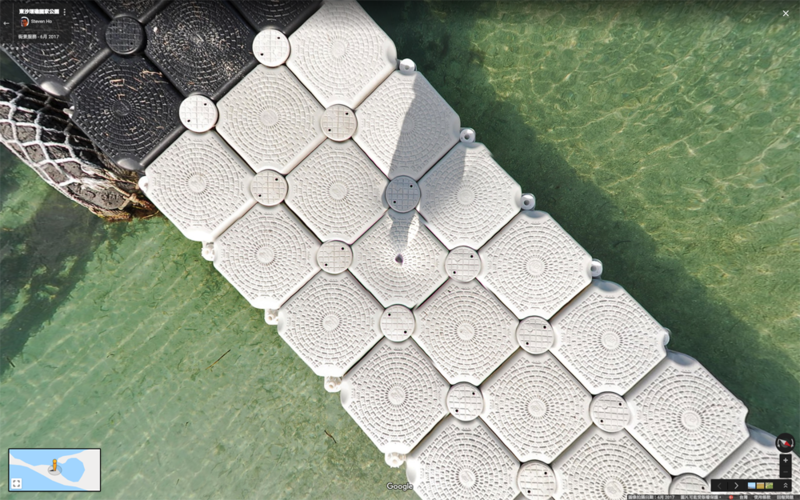 There weren’t, as well, the fast-growing artificial islands (reefs) shown on CNN website. The airplane was traveling alone across Air Defense Identification Zones (ADIZ) of different countries (political entities). I wondered whether other passengers of various nationalities were touched by the same emotion – the excitement and thrill of flying across a vastness that is far away from the territory of one’s own country. The glaring light carried information of the external world and shed into the cabin through screens and windows. It kept changing while the plane flew across different ADIZs. The information was hardly discernible to human eyes. Certain transmission of signals was created by the light. 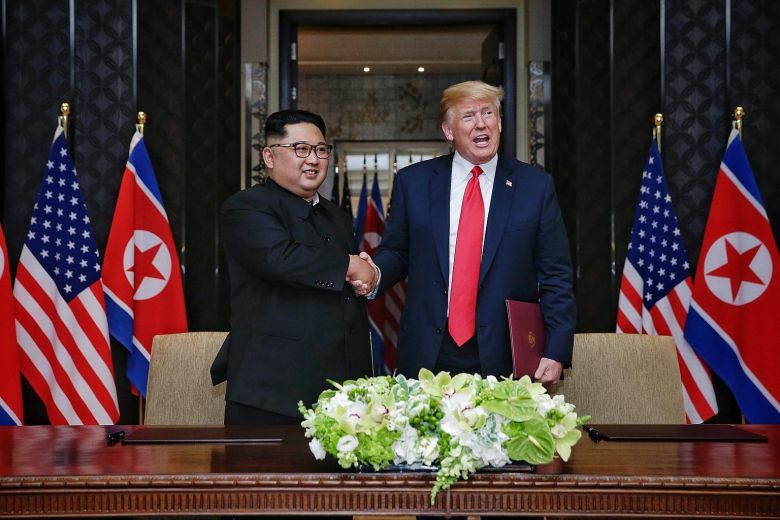 Mixed with an information influx – the accompanying Mirage 2000 jet fighter, Ma Ying-jeou, Xi Jin-ping, Kim Jong-un and Trump, all of which shook hands with one another and embraced endless Media spotlights – the signals were in sync with the light reflected again and again by glistering waves. Nandawu Mountain, Orchid Island and islands with military bases had lined up in a row and headed towards an aircraft carrier. Amidst all these changes, however, visuality was not able to know its position. There was no positioning of visuality itself. Like a drone produced after the speculative technological singularity, it read the refracted light and signals of another dimension, the sphere beyond human observation and comprehension. In downtown Taipei, two buildings, built at different times yet now joined together into a bigger complex, stood in front of an open lawn area. Walking through either passage between the two building – the courtyard overgrown with weed as though things had returned to nature, or the narrow staircase connecting two buildings – and cutting through the buildings for a sectional view made me feel as if I sliced through particular space and time in order to arrive at another side of the space-time gap. The building complex used to be the former “Industrial Research Institute of Government-General of Taiwan” under Japanese rule, yet for a longer time it served as Air Force Command Headquarters for Republic of China. During the time of Japanese rule, there were numerous doors along both sides of the wide and endless hallway, each connecting to rooms of different sizes and leading to various paragraphs of the history. The vision on the right: after walking through a dark reception, there was a big, sun-lit room. On one wall of the room, titles of different rankings of government officials were listed. 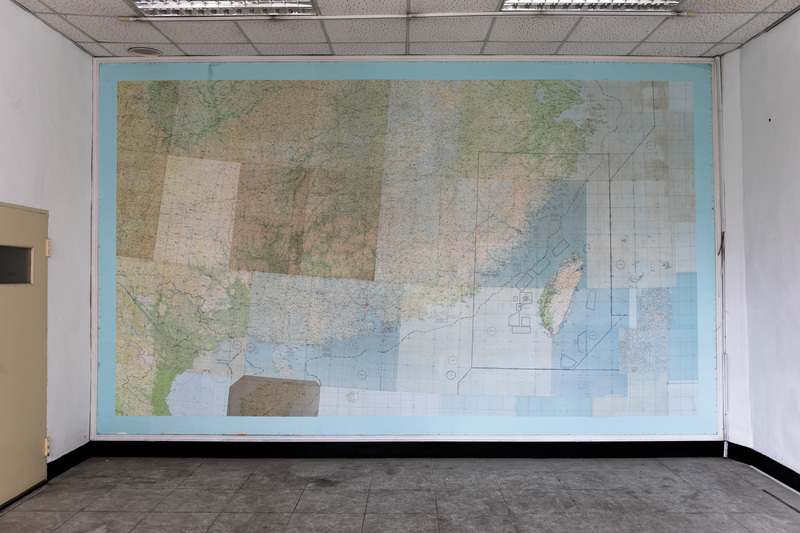 On the other side, an enormous air force military map was mounted on the wall. The map was nearly the size of the room – not because the miscalculated frame awkwardly touched the edges of the wall but because the room was tailored-made for the map. What was visible on the second floor was only a part of this giant two-dimensional representation. 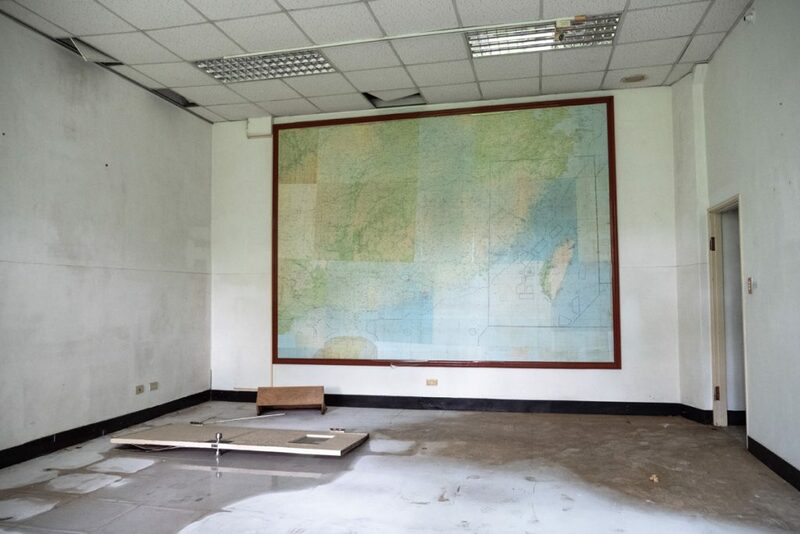 Other patching fragments of the map were spread out in the room, such as the waters surrounding the island of Taiwan – from the East China Sea, Taiwan Strait, Bashi Channel to the northern part of South China Sea. The southern parts of South China Sea started at the top of another room downstairs. Limited parts of the world were to be seen only at different floors and divisions of the building. Then the vision on the left: a light source at the end of the hallway moved towards the left. The scene looked familiar. There were doors, too, lining up along the hallways. After the dark reception, one entered another sun-lit room. I felt as if I were the second cat who walked into the Matrix and then through the porch. On one side, titles of different rankings of government officials were listed on the wall. On the other, a large air force military map was mounted, covering the whole wall and, likewise, consisting of several collaged parts. Their diverse shades indicated the process of photography and cartography at different times. They were observations carried out in various periods now informing us of regulations on airspace in the past near the island. Confronting different shades of the collaged maps, visual activities happening here were like anchor points against which how distant in time the collaged parts could be measured. The viewers stood here and looked – all pieces were no longer flattened images on the wall. Some were more remote and some more recent. As parts of a representation of the earth, the map in front of our eyes didn’t present altitudes or resemble the physical topography. Yet it wasn’t merely a flat and unified image fitted perfectly onto the vertical wall either. Each collaged piece, made at a specific time, carried with itself corresponding length of history. The gap between two acts of visual activities could be closed by a line – the linear distance between two dots on the map was the shortest, and it transcended space and time. A map that distorted space and time. It was a documentation of plans which could possibly cast influences on the airspace in reality. Nearly inaudible, the second drone glides through the air outside of the window. A visual activity determined by algorithms now happens in the sky with its autonomy. It sets its direction, plans the trip and defines its own destination. 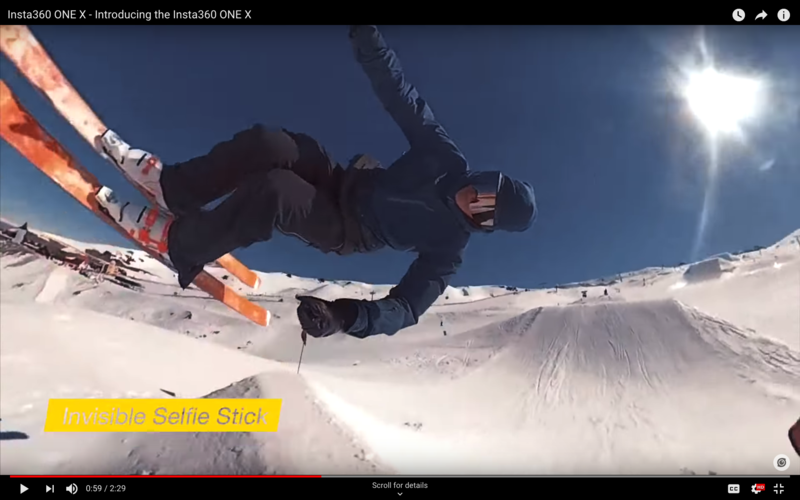 Like a well-coordinated dual lens camera which can move freely, a 360-degree camera made up of six fisheye lenses, or the compound eye of a fly which consists of 4000 tiny visual units, the visual activity performs its agency to plan and see. It can be a monocular vision patrolling in the air; it can also be a binocular vision; or it can be a collective vision like that of herds of insects or birds which they carry out as groups in order to support each other. The visual activity of a drone doesn’t require a trigger cable. Like the selfie stick being left out in selfies and the tripod invisible in a 360-degree image, the wireless signal is now an equivalent to optic nerves and the body.